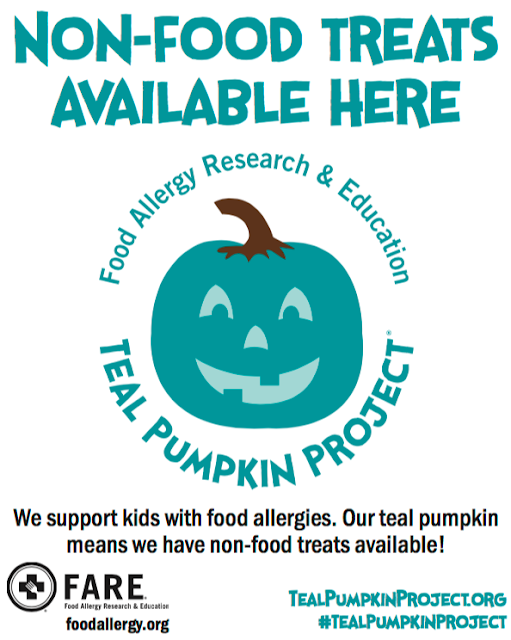 Are you familiar with The Teal Pumpkin Project? If not, you may want to participate in it this year, especially if you have kids with food allergies or know of any in the neighborhood that do. The teal pumpkin project was created so that all kids could have a safer Halloween. By putting a teal-colored pumpkin on your doorstep, you are letting trick-or-treaters and their parents know that you will be providing non-food items as treats on Halloween. Make Halloween in your neighborhood an all-inclusive occasion for the kids this year by providing food/candy alternatives to those who can't eat packaged candies & treats.